To get the most out of this guide you need an SEMrush subscription. Use this link to start a free 14 day trial! Like many of their competitors, SEMrush has a concept wherein you can track a website (yours or a competitors) and they will regularly crawl your website and email you with recommendations. For a long time I did not use this feature, but that was to my detriment as they actually provide great takeaways and deep insights. While I firmly believe in using multiple tools (and I have access to not only SEMrush, but also Ahrefs, Screaming Frog, DeepCrawl, Moz, and more), SEMrush has surprised me how it has become a larger part of my workflow as I’ve used their various tools. Note: Credo is a SEMrush affiliate, and because of that they’re offering you a FREE 14 day trial when you use our exclusive link. I had always used SEMrush for keyword research and competitor research, but when I began using SEMrush’s “Projects” the utility of the tool skyrocketed. Here’s how to use SEMrush for technical SEO. Remember, you don’t need to crawl your whole site every week! While at the beginning of an SEO engagement it can be very helpful to have a full crawl, if your site is very large (tens of thousands or more of pages) then a full crawl might not make sense as at that scale, your technical SEO strategies must be more scalable than fixing specific issues like a few 404s or slow-loading pages. If your site is under 10,000 pages (the SEMrush auditor goes up to 20,000 as you can see), then a full crawl weekly may be useful to identify trends over time. The choice is yours. I choose to not have SEMrushBot respect robots.txt because I want to understand what URLs are blocked by robots.txt in case a change was made and something became blocked unintentionally. This does happen, and thus is something to monitor over time. 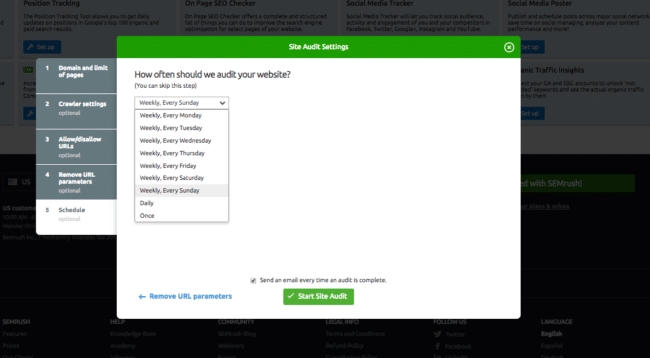 Now click Start Site Audit and they will get to crawling. As they complete more crawls, you will receive emails with your score, crawled pages, and updates on how things have changed week on week. I will say that my one gripe with the technical monitoring in SEMrush is that their scores tend to vary widely based on the scale of different “issues”, though these “issues” are not always super high priority. At the end of the day I’d rather have more notifications than fewer, so overall these emails provide a lot of value and having crawl data weekly is incredible for monitoring issues. I tend to ignore the Total Score because it does not give me insight into overall how my site is doing or why the score is what it is. Total Score seems to be a directional metric weighting Errors, Warning, and Notices and assigning a score. You should also be careful of chasing a score within any tool, as even when you achieve a “perfect score” there are still many things to do and that is just a score for one part of your site. Unfortunately you cannot hide individual issues within these views, though you can do that within the overall Errors and Issues pages. One thing that I love about SEMrush technical reports like this is the ability to send them to Trello. I operate my business within Trello and so can easily create each issue as a Card within the Trello Board and List of my choice. From there, you can prioritize them! I talked earlier about comparing week over week crawls, so let me show you that within another Project I have set up on SEMrush. There are three things to keep in mind here. First, I love this view because it helps me understand well where issues are being fixed and where they are growing. This lets me see all of the issues, and their counts, within the context of others which lets me prioritize them based on impact and not just respond to the biggest increase of the week (in percentages). Give yourself the gift of focus! Second, you’re not just chasing a number. While we should be looking to minimize as many issues as possible, prioritizing them based on impact is much more effective. Third, and most importantly, this can view can be a great way to make a business case for the fact that an issue is growing on your site and becoming a major issue. If your 404s spike, then you can a) dig into it and b) make a case for it being a large issue that deserves to be fixed. Use this data to make things happen, especially if you are working inhouse and have to prioritize fixes according to business impact and work with product managers, designers, and engineers to get things done. 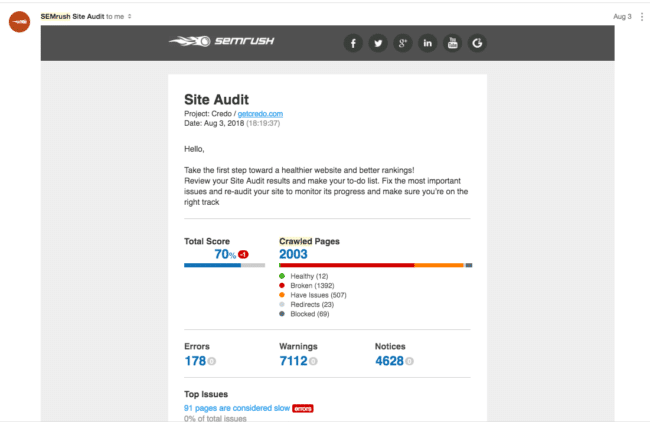 Now that you’ve finished this article, you understand better how to use SEMrush for technical auditing. Go forth and optimize! Note: Credo is a SEMrush affiliate, and because of that they’re offering you a FREE 14 day trial when you use our exclusive link. If you sign up for a paid account after the free trial, we may be compensated monetarily. Check out all of the sections of the SEMrush guide. This is the last section.